4,500 Square Feet Of Luxury. Open Floor Plan Great For Entertaining. This very unique property sits on a full acre of lush landscaping. Private Pool and Hot Tub.Large Out Door Living Room with Large Gas BBQ. This home has it all, and we are located just minutes from the Airport and Las Vegas Boulevard. This home's Features (four) bedrooms and Den set up as 5th Bedroom.This home also has (4) Full Bathrooms.You will not be disappointed, this home has all the comforts of home and more...Large Games Room with Bar Pool Table Poker Table and 70" Flat Screen TV with Surround Sound. Downstairs Guest House at the Back of the Property that will Accommodate 2 More People , must be booked separately. Upstairs Guest House Used by the Property Care Taker. Guest House can Accomadate 2 More Guest taking Occupancy to (16) People. This home is great for all your entertainment needs. Event/parties must be pre approved by owner prior to event. Close To Strip and All Service.Not everyone wants to Stay on the Strip in a Mega Hotel. All the Luxury's of Home,Private Pool Spa. Large Dining Room Table with View of Pool and Back Yard. Outside Only All Butts must be Placed in Trash.. It was clean and way bigger than I thought. Me and my family had a blast. So much room!! Thank you so much for allowing me to have my event there such a wonderful experience and space. The property was beautiful! Everyone loved it! We had a great time at your Las Vegas home. It is conveniently located with in 10 min or less from the Las Vegas strip and 5 min from the airport. The home sits in a beautiful well maintained property. All rooms, electronics and amenities are well kept and the interior of the home is kept very clean. The property keepers are very friendly and are great people. I highly recommend this home and plan on booking this property next year! Great location, great yard and patio, great house. Toilet leaks so bad the water comes on so often I couldn't sleep the first night. Then I shut the water off, in other reviews others have complained about this. Every light in the house has one or two bulbs out. The toaster doesn't work, we had to replace TV remote Batteries. All cups silverware, dishes, pots and pans were dirty. Some had lip marks and food stuck to them. A little attention to detail for this nice a place would be nice. Also people should be warned that there is other renters in the backyard pool house. Just would be nice to know that going in. There is no garage access, that would also be good to know. I always park in garages and parking under the large trees on this lot leaves tree sap all over the car. One call any and all of your issue's would have been handled immediately. Not once did you reach out to us to inform us of any issues. Hard to fix anything if we don't know there's a Problem. Once receiving this review had our Electrician go in and a Plumber. There was 2 Burn't out Light Bulbs in Laundry,1 in Living Area and a flapper Valve that was defective. All have been taken Care of. It's Spelled out Clearly in our Listing that there is a Guest House on Property and it's Rented Separately, as well no access to Garage. Awesome house, pool, hot tub, all the amenities! Just wanted to point out the toilet nearest the bar and upstairs hallway one both run, could save a few bucks by fixing them. Enjoyed our stay very much!! Homes in this Area are all on half Acre Plus Lots.This Property is on an Acre and a Half. 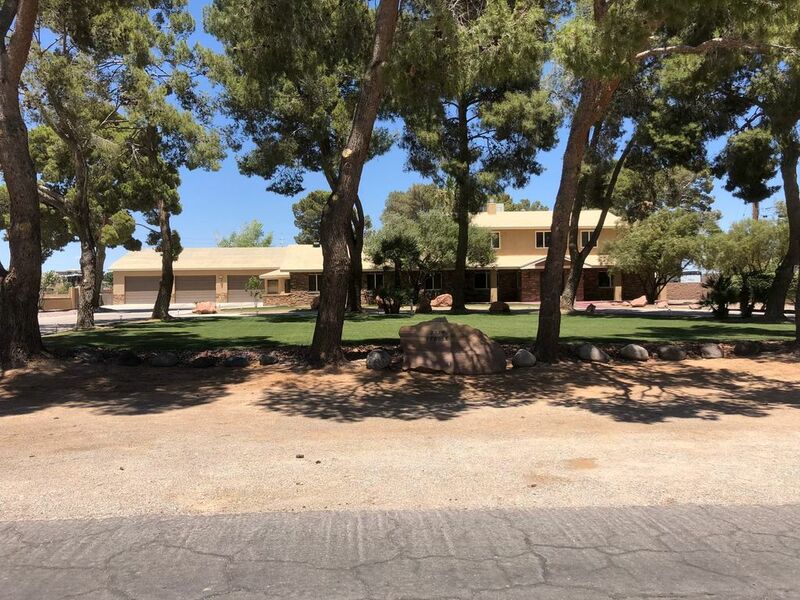 Offering lots of Privacy.Minutes from Las Vegas Strip,Walking Distance to 2 Local Casino's Silverton & the Bass Pro Shop and South Point Casino where there is a Movie Theatre and Bowling Ally.There is also a Ranch a Block away where Children can go and Pet lots of Animals.